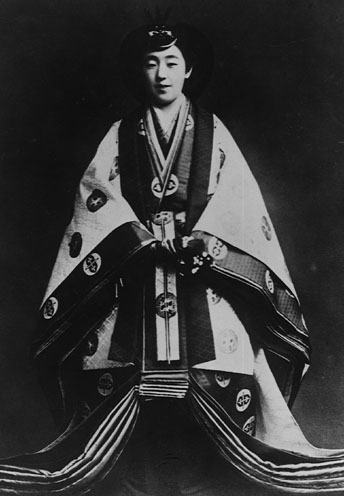 Murasaki Shikibu writing her stories about Genji, wearing jûni-hitoe. 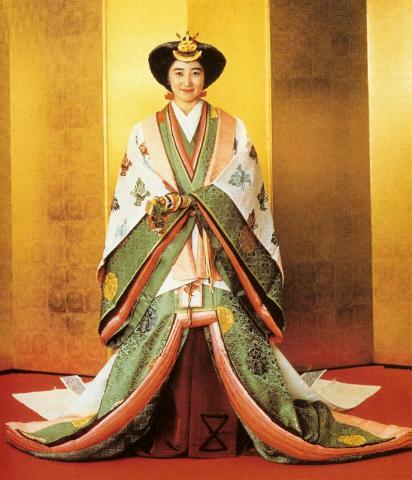 Is the name used to define the colour combinations used for HEIAN (794 to 1185) period formal female court attire. 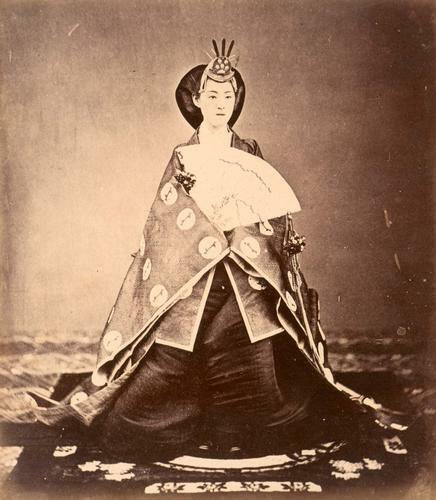 During this period in the Japanese Court the ladies-in-waiting, princesses and empresses wore a specific style of dress that was based originally on a Chinese style of dress. 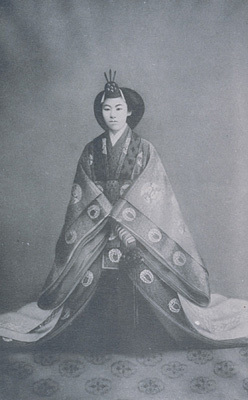 As always the japanese adapted this to their own desires and from that emerged the style of dress generally known as JÛNI-HITOE, or roughly translated "12 layer robes". The name came from the many layers of robes, of the same shape but diferent colours, that were worn over each other. 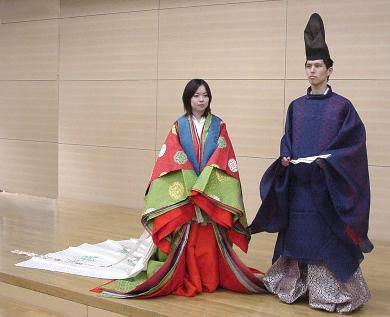 During the early HEIAN period the number of layers could go up to 20, resulting in governamental rules to be placed on the amount of layers that could be worn. Imagening the amount of weight that must have been to carry around, it is not surprising that these women didn´t actually walk much, but generally crawled small distances and needed help of assistants to move larger distances. The new laws decreased the amount of layers to around 5, not including any official over-robes that could be worn. The name for these 5 layers is ITSUTSUGINU (being 5 KINU or UCHIGI robes. 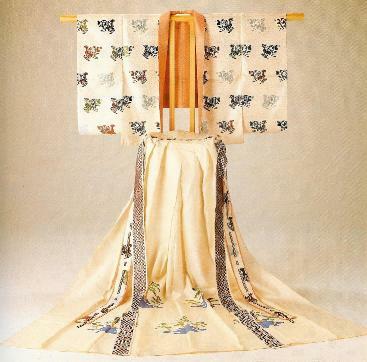 Below the ITSUTSUGINU a robe called HITOE was worn and a style of underwear known as KOSODE (small sleeves) which is the origin of the dress we know as kimono. 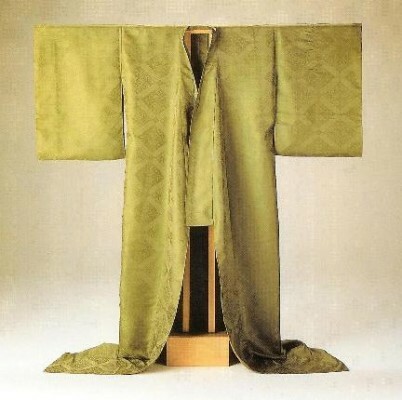 Over the ITSUTSUGINU a few styles of robe could be worn, like ICHIGINU or UWAGI and a jacket known as KARAGINU with a type of apron worn at the back known as MO. Nature, not only the heat and cold but also period of the year, had a large influence on the styles and colour combinations that could be worn during the year. This resulted in rules and regulations in colour and materials in diferent styles with names that would identify them. In the Japanese Court it was very important to be aware of the and dress accordingly. Making the right choice in dress could make or brake one´s career and name. These pages try to explain and visualise in brief what it looked like to be dressed in this style of attire and how the colours and styles of material would have looked like. Court dress of that period is invariably described in the diferent novels or pillow-books of that period, ie. 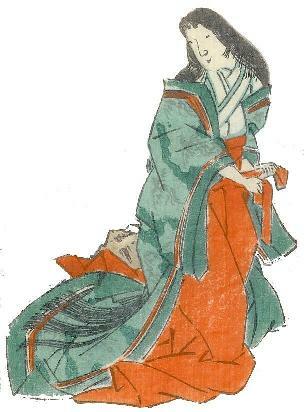 The tale of Genji and The pillow-book of Sei Shonagon. One oficial record that has been preserved is the list of combinations written by Minamoto Masasuke para Senior Grand Empress Tashi in around 1160. 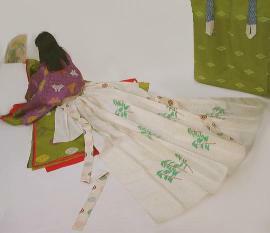 That document is known as " Colours for a Court Lady´s Dress" which is part of Masasuke's notes on court costume (Masasuke shôzokushô). It also contains additional notes assumed to be by the empress herself. 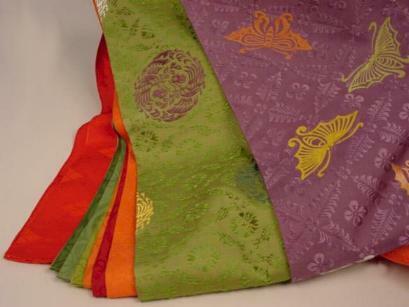 These colour combinations can be found in the seccion The wardrobe of Empress Tashi. 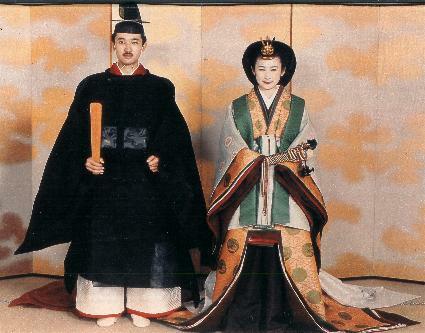 Currently this style of costume is only worn by female members of the Emperor´s family coronation purposes or any princess at their wedding. 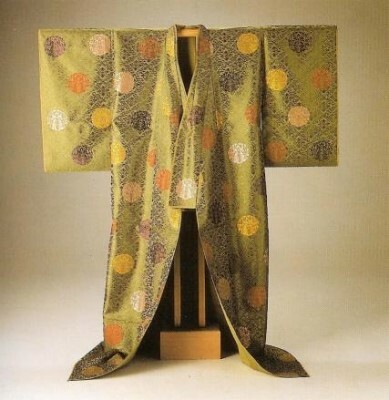 KOSODE, underkimono with small sleeves. Chemise or unlined first layer of a set of gowns. 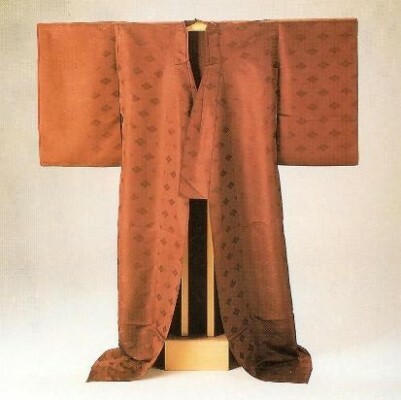 Is worn between utsutsuginu and uwagi. showed but provided stiffening for the formal gowns. the higher the position of the lady. Worn with the mo, brocaded or embroidered or painted. Apron skirt that was worn on the back as a train"
or purple, depending on the combination chosen. The colours used were controlled by the governement. 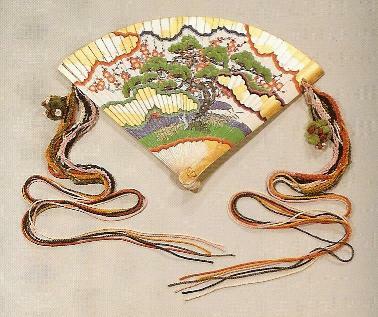 Certain colours were only worn by people in certain levels of the japanese population. For court outfits the following were the main basic colours used. Lighter and darker variations were made by dying the material more or less times than the base colour needed. For more variations see the Colours page. 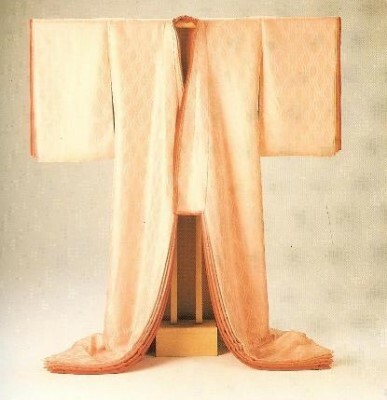 MADE BY: The Takata Institute of Japanese Imperial Classical Costume in Tokyo. 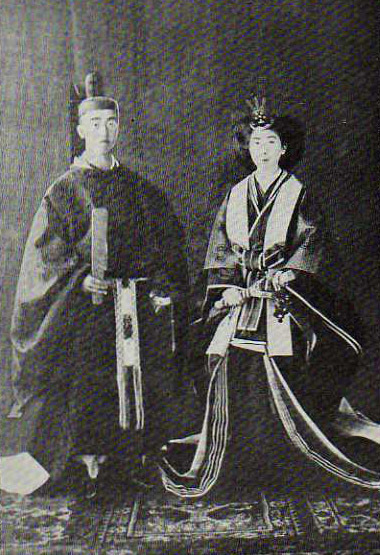 NYÔBÔ SHÔZOKU (costume for a Court lady-in-waiting) and the equivalent male version. How the MO is worn! Colours of the different layers of the costume seen at the sleeves. © www.fuyuya.com, where not otherwise specified.